Hundreds of years ago, Pacific Islanders used voyaging canoes to travel. They developed navigation techniques to steer across the ocean without instruments or charts. The Marshall Islands is a nation in the western Pacific. The land is formed from low-lying coral atolls and islands. Western researchers have studied Marshallese canoe construction and navigation techniques, including their unique understanding of wave patterns. As deep ocean swells strike islands, some of the wave energy reflects back to the ocean. As swells pass by an island, some of the wave energy bends, or refracts, to create a crossing wave pattern. Wave refraction patterns are visible in this satellite image. The crossing wave patterns extend miles past the island, which show the navigator the direction and distance toward land. Marshallese navigators model the wave patterns by creating designs of symmetric lines and curves. These devices, commonly called “stick charts,” are used to prepare for a voyage and to teach students. 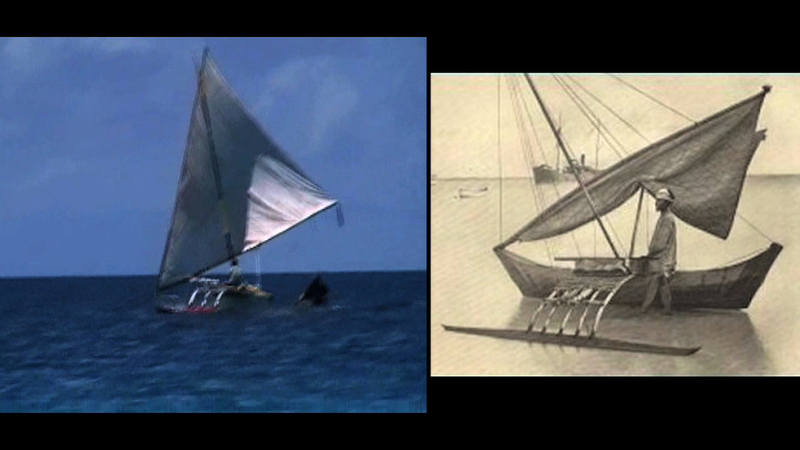 Modern science is just now beginning to understand and appreciate the traditional Marshallese navigation techniques. With only a few surviving master navigators, it is crucial to pass on this knowledge to their children so this unique maritime heritage will not be lost forever. Hace cientos de años, los isleños del Pacífico utilizaban canoas para viajar. Ellos desarrollaron técnicas de navegación para dirigirse a través del océano sin instrumentos o cartas. Las Islas Marshall son una nación en el Pacífico occidental. La isla está formada por atolones, bajos de coral e islas. Investigadores occidentals han estudiado de las Islas Marshall y last técnicas de navegación, incluyendo su sin igual comprensión de los patrones de las olas. Al golpear el océano profundo islas alejadas, alguna de la energía de las olas se refleja de vuelta al océano. Cuando pasa una marejada por una isla, alguna energía de las olas se curva, o refracta, para crear un patron de onda de cruce. Los patrones de refracción de las olas son visibles en esta imagen de satellite. Los patrones de ondas de cruce se extienden kilómetros más allá de la isla, los cuales muestran al navegante la dirección y distancia hacia la tierra. Los navegantes de las Islas Marshall modelan los patrones de onda mediante la creación de diseños de líneas simétricas y curvas. Estos dispositivos comúnmente llamados “cartas de palo”, se utilizan para preparar un viaje y para enseñar a estudiantes. La ciencia moderna está ahora empezando a comprender y apreciar las técnicas de navegación tradicionales de las Islas Marshall. Con solo unos pocos navegantes maestros sobrevivientes, es crucial el transmitir este conocimiento a sus hijos para que este patrimonio maritime único, no se pierda para siempre. "Wa" is the Marshallese name for its outrigger canoe. It is the fastest indigenous watercraft in the Pacific. Different countries / cultures have different names for outriggers. In New Zealand it is called waka ama; in Tahiti and Samoa it's va'a; Philipines and Indonesia it is bangka; and Cook Islands calls them vaka. Outrigger canoe racing is a very popular sport around the world. It is the state sport of Hawaii and entire families will participate in summer regattas. There are even "marathon" races which are 42 kilometers long.